Article Courtesy: pbs.org | By: Patrick Whittle | Originally published: January 13, 2019 | Please click here for original article. 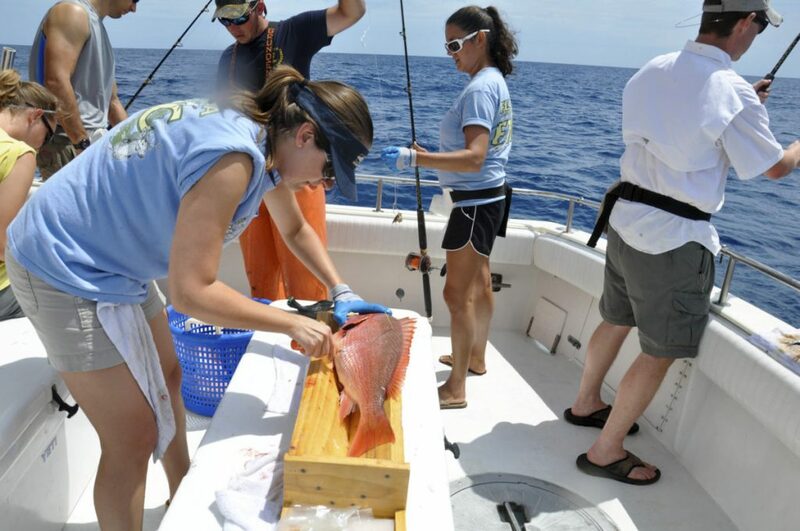 Above: Stephanie Freed tags a red snapper off the coast of Panama City, Florida, in this handout picture taken April 3, 2012, courtesy of the Florida Fish and Wildlife Commission. There is a federal catch quota for red snapper, which was designated as an over-fished species in 1988, back when some Gulf fishermen say they rarely saw one. The scientists at the National Marine Fisheries Service say the snapper stock is rebounding. But the fish population remains disproportionately young and in need of continued protection to achieve the proper age mix to sustain itself, they say. Image Courtesy: REUTERS/Florida Fish and Wildlife Commission/Amanda Nalley/Handout via Reuters.